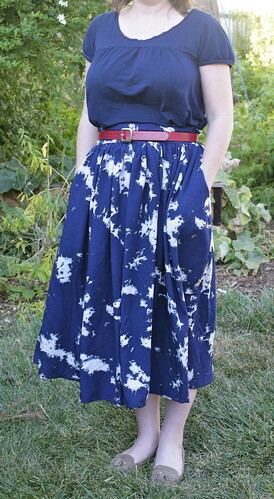 Inder Loves Folk Art: Better late than never: Rayon Gathered Skirt. Okay, here is one of those projects I finished a while back but didn't blog. 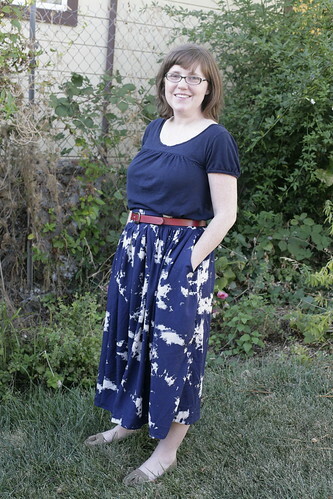 A lovely gathered skirt in soft, flowing rayon challis. It was a very simple affair - just two rectangles gathered onto a waistband with a side zipper. 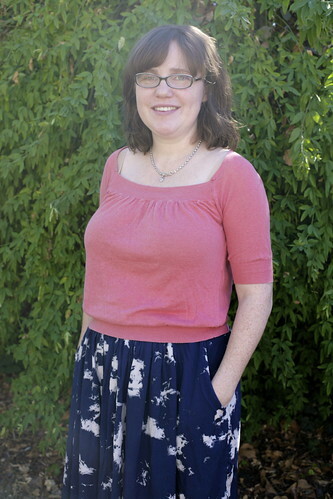 I used Megan Nielsen's "Kelly Skirt" to help me cut the pocket pieces - otherwise, I made it up! My first version of the skirt was "midi" length which is what all the hip people are wearing these days. 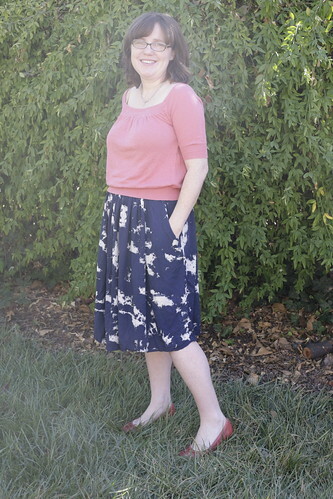 The rayon challis is cool and soft, and this skirt was a pleasure to wear. But when I uploaded the photos, I decided that "midi" looks more "middle-aged" on me than "young and hip." Especially since I am unwilling to wear five inch heels on a regular basis. There is nothing wrong with a more conservative look, but I am still pretending I'm not yet middle-aged (shush, you). Knee-length just feels more flattering and comfortable for me. Do you have a favorite hem length? Or do you roll with the trends?. I don't roll with trends because I never know what the trends are! (I'm avant-garde that way. )Your skirt is lovely at both lengths, but the shorter length does suit you better (and, am I mistaken, or does it even hang a bit better at that length?). You look so nice -- I really like your bangs! oh i totally agree with you on the skirt length - and i loved the post you linked to from a couple of years ago - it made me laugh! and your bangs/fringe is back! I like it shorter:) I don't mind longer skirts, but I agree with the makes you (in general) look older thought. Though I am not a fan of too short either, I think you hit it just right.